Day 145 & 146: We’re back! Well, you can stop restarting your computer and wondering if the internet broke last week, I can confirm that there were in fact, no updates posted on the DCCA website. This is because Priscilla is very poorly at the moment, so I am sure that you will join with me in sending her our very best wishes and hoping she feels much better soon! For now, I (Anna) have tentatively tried my hand at blogging and you will have to forgive the results. In contrast to the web team’s lack of input last week, the site team have been hard at work and much has occurred since you last saw inside the Centre. We have a glass frontage to the entrance! We hope that this will make our Centre bright and inviting to all. Who knew the G-team were so great at creating a friendly welcome?! 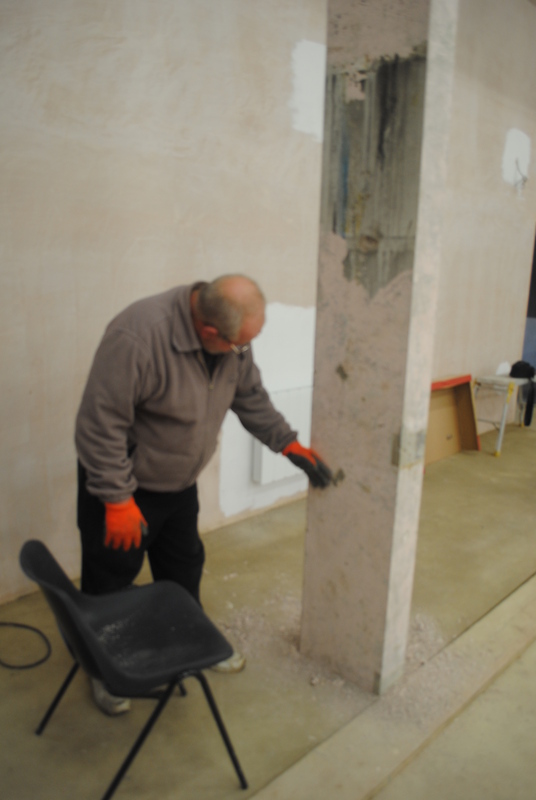 Today, Graham has been sanding down the concrete pillars in the main hall, which will soon be painted a dark colour in contrast to the pale walls, providing the hall with a beautiful feature akin to the ribs of a living, breathing creature. The question now is: Who is going to bring life to this building? Could you be one of the first people to come and run an activity in this exciting new space? Do you know of a club in need of a new meeting place? Would you like to come and help the building run by keeping it clean or unlocking for our users? There’s room for everyone… get in touch with us! ← Day 138: Hurrah! Time for our sand conversation!